It was a pleasant surprise when Tamiya announced that its latest 1:24 scale sports car kit would be the Aston Martin DBS. 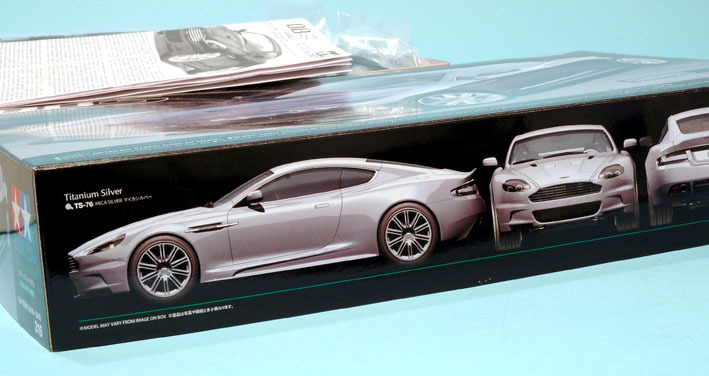 It should also be said that although the kit has not been issued ‘from a James Bond movie’ per se, given that the car’s first appearance was several months before its official 2007 launch in the Bond film Casino Royale the opening comments in the instructions can hardly avoid making this point. 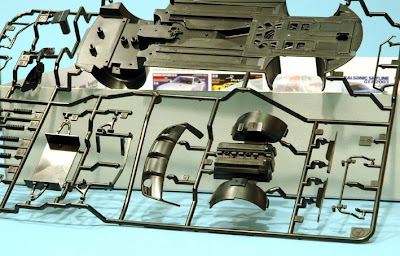 The kit is classic Tamiya and, although a complete V-12 engine is not provided, everything that’s normally visible inside the engine bay is there. You are not going to miss the lower section of the engine anyway, as the underside is hidden by the floor pan. 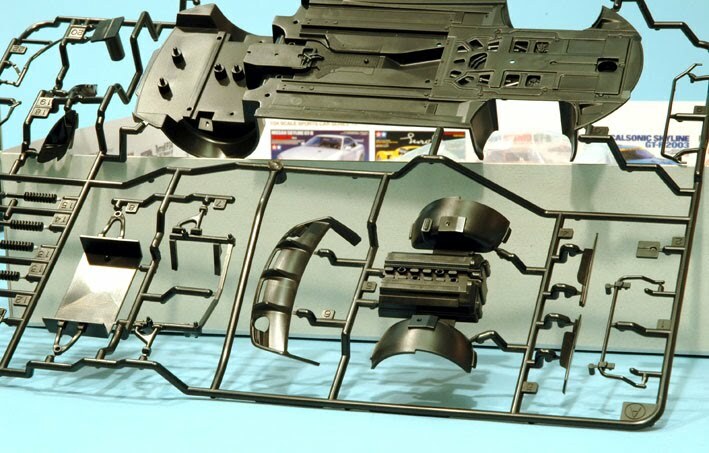 Elsewhere in the kit, Tamiya provides full suspension, huge chrome-plated wheels, and low-profile tyres. All wheels revolve on the now-standard nylon bushes and the front pair steer. Only a left-hand drive interior is supplied (which is fine for the Bond car), though you can choose full manual or Touchtronic automatic, with various optional parts and decals. Either way, you get photo-etched parts for the appropriate foot pedals. Photo-etching is also supplied for the lower grille mesh, while the classic Aston Martin shape upper grille is on a chrome-plated runner. You get waterslide decals for some of the grilles, instruments, under-bonnet labels and AM badges, and ‘metal transfers’, which are self-adhesive, for the Aston Martin logo on the engine block and glass for the rear-view mirrors. 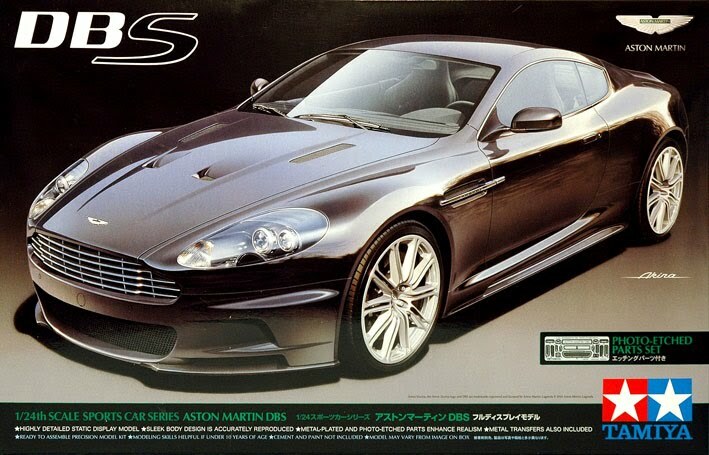 Intriguingly, although Casino Royale is the movie mentioned, the Tamiya car more closely represents the DBS in Quantum of Solace - well, the licence plate (with a bit of judicial re-jigging) is correct anyway! However, whether you want to add criminal damage and remove the driver's door is up to you! 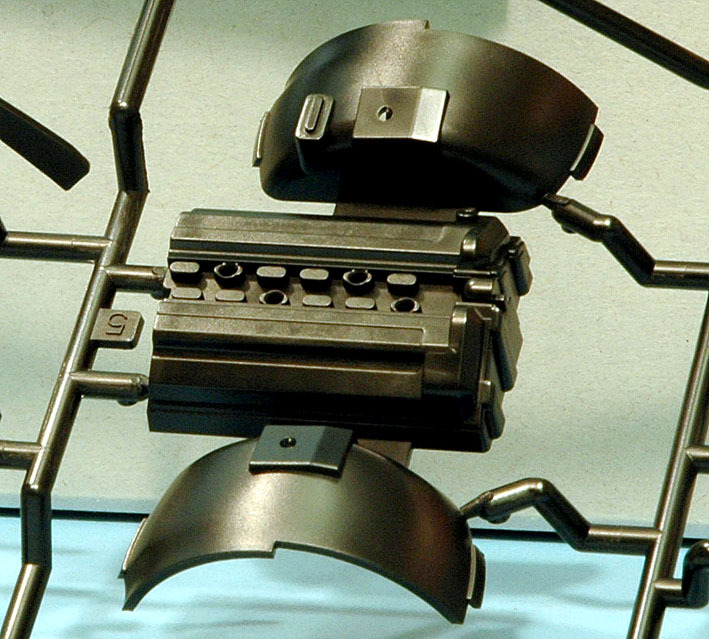 1 The box-top is to Tamiya’s usual design style, and very handsome it is, too. 2 Box-side illustrations show the car in Titanium Silver, perhaps a nod towards the Goldfinger DB5? 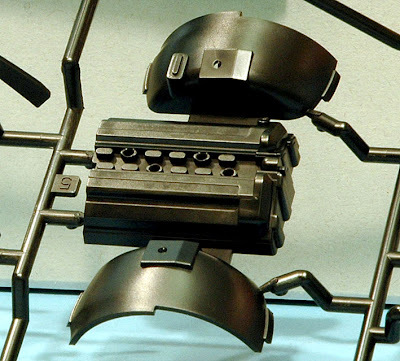 3, 4 The top section of the engine block is moulded as one piece with the inner wheel arches. 5 Photo-etched and chrome plated parts. 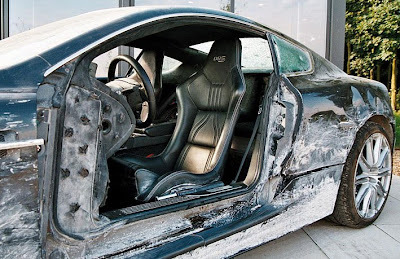 6 Quantum of Solace DBS looking somewhat worse for wear, and minus a door. 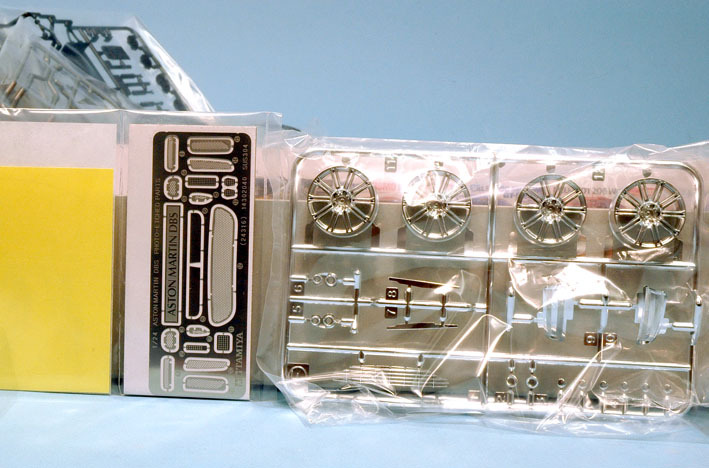 The kit was supplied by Tamiya’s UK importer, The Hobby Company here. If you like Bond in general, there’s a selection of stuff to enjoy here. To find out more about the real thing, visit Aston Martin here. Quantum of Solace picture courtesy the Strangways movie blog here.